Harbouring great love for the Disney film, I went into Aladdin The Musical at Crown Theatre with my expectations in check. Was it possible for anything to live up to the cultural milestone that is Robin Williams’ Genie? Short answer: yes it is. From the intricacy and vibrancy of the set to the charisma and sheer talent of the cast, Aladdin The Musical is a spectacle of unparalleled proportions. It is unsurprising to learn Ainsley Melham, who plays our beloved protagonist, is of Hi-5 pedigree. He is clearly at home onstage and nails the balance of cheek and confidence that defines one of Disney’s most beloved characters. Meanwhile, Perth-born newcomer Shubshri Kandiah was born for the role of the headstrong but pampered Princess Jasmine with her grace and beauty. Gareth Jacobs ultimately steals the show with the hilariously larger-than-life Genie. While it would be easy to mimic the movie character that Robin Williams made iconic, Jacobs breathes his own sass and flamboyance into the formidable role, meaning no witty one-liner goes unappreciated by the audience. Don’t go into Aladdin The Musical expecting a carbon copy of the film. Firstly, Aladdin’s monkey buddy Abu is swapped out for three lovable cronies, Babkak, Omir and Kassim, who have their moments to delight the crowd with numbers such as ‘High Adventure’. Similarly, Jafar’s sidekick Iago is a human rather than a parrot; Adam Murphy and Aljin Abella nail the evil duo dynamic with their repetitive evil laughter. Aladdin The Musical comes with four new songs that were written specially for the stage by Disney legend Alan Menken, and three songs that were written for the film but not included due to running time. However, rest assured that all your favourites are still a part of the fun. Set in the glittering, gold Cave of Wonders, Genie’s ‘Friend Like Me’ will assault your senses in the best way with its extravagance; it’s not everyday you see a standing ovation in the middle of the first act. With the iconic magic carpet and starry backdrop, Melham and Kandiah’s rendition of ‘A Whole New World’ will invoke nostalgia and fondness like nothing else. 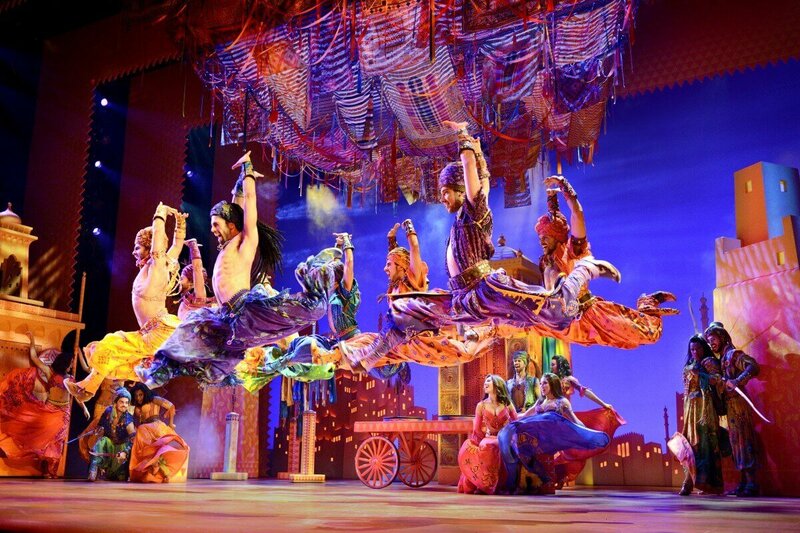 Aladdin The Musical is triumphant in putting its own spin on the Disney classic. The Perth season continues at Crown Theatre until October. Grab your tickets to the musical event of the year here.